This is the message I delivered January 3rd, during the opening of our sixth year of Reflections. This is the sixth year of the school, and I’d just like to welcome everyone to the sixth year. There’s something special about…well, each year is special. I know some years I’ve been very weepy at the start, or weepy at the end. But there’s something very special about being able to get to a sixth year. One away from the seventh, and once you get there it’s sort of like settling the first chakra. We’re heading toward that place, where we’re starting to get the root of the school really solid, and so that feels so momentous, there’s like a momentum there. I’m really excited about it. It really warms my heart to have you all here as part of that journey; a journey that is part of all of our contributions. Now we are all involved in this process of creating this container, maintaining it and caring for it. It is one of those things that is often invisible. I know part of my job—my primary job—is maintaining the container, but if it was only up to me, I don’t think it would be as strong as it is today. Our container is rich, deep and multi-layered; it is just so incredibly intricate. It is like looking at a fractal. There’ve been some incredible pictures as of late of three-dimensional fractals and the beauty inherent in them…you can see things that resemble cathedrals, fountains, trees and orchards, and it’s just an incredible richness that was only hinted at in the two-dimensional renderings which only came alive in the three-dimensional. Our school container is just such a multi-dimensional structure. At every level you go down you find the pattern repeated, and it reveals such a rich, beautiful, and intricate pattern. Some of you are starting to see some of those patterns, and as a result your own work is deepening. But everyone has deepened and grown through this process. It’s the not so obvious, the subtle work, that does this. 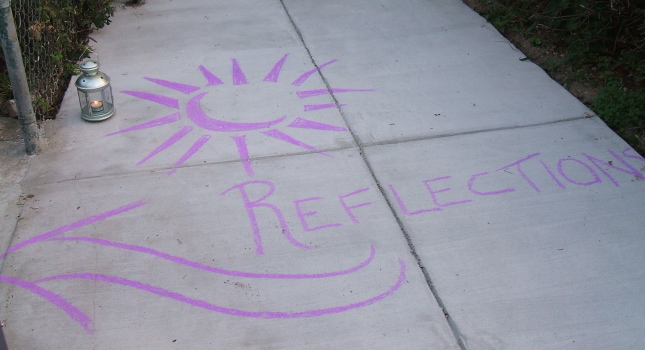 Every once and a while I discuss the core of reflections -- the work of the soul. The work of the soul is heady work; it is not for the light-hearted. It is not for folks who are unused to pressure or discomfort or disillusionment or disintegration. Quite frankly, it takes courage to walk this journey -- it takes such deep courage. It takes the kind of courage that we are often unaware of in the larger culture. It’s not the kind of courage that you see in a film when you see the hero say, “We’re outnumbered! We only have four bullets and there’s a hundred people outside, but I’m gonna make a run for it!” Not that kind of courage, that kind of courage is actually quite silly, if we are honest about it. But it takes the kind of courage that, to me, is more reminiscent of the courage of my ancestors, where you didn’t know what each day would bring, whether you would live to see the next morning. But there was still, even within that unknowing, still time to comfort a child, to take care of an elder, to show someone love. Even in that uncertainty, there was strength of character; it mattered what we did, even if this is the end. That is the kind of courage I am talking about. The kind of courage that says, “I don’t know where I am right now, I don’t know what to do, but I’m gonna show up.” And that’s the kind of courage that it takes to do this work, to be here, to be on this journey, to walk this path. And I want to honor that. Part of my job is to honor that journey; every single journey, because every journey is unique. However, if you step back far enough, they’re all part of the same glorious, blossoming life of spirit, of mystery. It really needs to be acknowledged, on my part and on your own parts, how far you’ve come, how much you’ve grown, and how much you’ve contributed to the growth and development of others here in this room, as well as outside of this room. And I know that even as a teacher, I have learned more by working with a school as opposed to just teaching classes. So I’ve grown, and my growth, development and journey has been informed by your growth and journey. It’s a process that’s unfolding and revealing in and of itself. This is really a journey that we are taking together; a journey of spiritual community. So when you look at yourself and how you are developing and moving forward, even if you’re unaware of how much you are moving and developing—I can tell you all that you are—if you could see that pattern from a distance, you would be in awe, you would be in complete awe. But if you could see the journey this community has taken, you would be filled with such joy. This community’s journey is just incredible -- the blossoming and growth that we as a community have made. And I would like to think that it has had an impact on our surrounding communities, our families, loved ones, and others. I’m proud of us as a community and I’m proud of you as individuals. So I want to especially applaud that, to acknowledge that, validate that. I am honored to be your teacher, I am honored to be part of your journey, and I am very, very proud of each and every one of you. And so thank you for continuing this journey. Thank you. Thank you for this. Thank you.